Experience the excitement of ancient Egypt with “Cleopatra II” slots from Wagerworks. This thrilling slots game offers players the chance to spin the reels in hopes of winning the ten thousand coin jackpot, which is multiplied by the number of coins played per line. The betting denomination is one dollar, which means that this game offers some significant potential payouts to lucky spinners. The thrilling graphics of this game include an ancient Egyptian themed background as well as such symbols as the “Cleopatra II” logo, Cleopatra’s headdress, Bast, a cat, tens through Aces, and the scattered sphinx. With a jackpot of ten thousand coins multiplied by the line bet and a maximum bet of five coins per line, players stand to win big with this exciting slots game. There are a total of twenty paylines to be found in Cleopatra II slots. Three paylines run horizontally through the games five reels, while the others run in a combination of horizontal and diagonal lines, increasing the ways players can hit a winning combination. While there is not an autoplay feature in “Cleopatra II” slots, players will find that there are many large payouts as well as a bonus feature to keep players entertained. 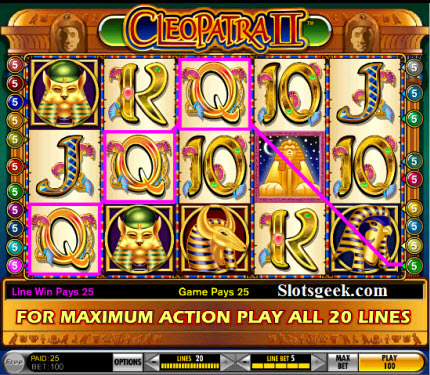 Among the payouts in this game is the ten thousand coin jackpot, which is awarded when a player gets five “Cleopatra II” symbols on an active payline. Four of these symbols pay one thousand coins, while three on a payline pay one hundred and two pay ten. This symbol is also the game’s wild symbol, and can substitute for any symbol on the reels except the scattered Sphinx symbol. Five Bast symbols or five of the Cleopatra’s headdress symbols pay five hundred coins, while four of a kind pay one hundred, three pay twenty coins, and two pay two coins. Players getting five cat symbols on a single active payline are awarded five hundred coins, while players with four win fifty coins, three pay twenty coins, and two pay two coins. Five Aces or five Kings on a single active payline are worth one hundred twenty five coins, four of a kind on a payline offers thirty coins, and three Aces or three Kings on a payline are worth ten coins. Players who get five Queens, five Jacks, or five tens on an active payline are rewarded with one hundred coins, players getting four are awarded twenty coins, and players getting three of a kind on an active payline are given a five coin reward. The last symbol is the scattered Sphinx symbol. When a player gets five of these symbols, they are awarded two hundred credits times the total bet and are given ten to twenty free spins. Four Sphinxes award ten credits times the total bet as well as eight to eighteen free spins. Three scattered Sphinx symbols pay three credits times the total bet and five to fifteen free spins. Free spins are played at the same bet as the triggering bet, and with each spin, the multiplier increases by one. Players can win more free spins during the free spin bonus. With so many thrilling payouts and bonus opportunities, there is little doubt why so many people enjoy the excitement of “Cleopatra II” slots.